These are interesting times for Argentina, the world’s eighth largest country. Are there lessons for the rest of the world? 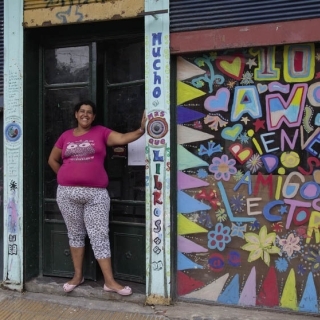 Vanessa Baird reports from Buenos Aires. •	questions about the vulture funds which buy debts at low prices. There is a danger that these vulture funds will lead Argentina into another big debt problem. •	questions about the British government. People say it is like ‘a colonial power’ as Argentina tries to find international support to get the Falklands Islands back (or the Malvinas, as Argentina calls them). •	questions about the World Trade Organization, as Argentina goes alone and restricts imports and controls currency. This worries some of its trading partners. •	questions about Argentina’s courts as the President tries to make big changes to make the courts more democratic. •	And questions about the powerful Clarín media group, as she tries to break up its control of the media and restrict the number of cable TV licences it can have. Through its media, the Clarín Group criticises the government. It blames the government for crime, corruption, and the economic problems. It also criticises the President for her ‘authoritarianism’ and for trying to silence the ‘free press’. In April this year, big protests brought more than a million Clarín supporters on to the streets of Buenos Aires. These stories have been reported in the national media and some of them in the international media. But there is another story that is usually not reported. It is a story not of government or policies or nationalism or media power, but of people and how they survive. Of the problems they have. It is a story of growing importance to people in parts of the world that are still trying hard to survive the effects of the 2008 global financial crisis. 11 years ago, Argentina was in the middle of its own financial crisis. In 2001-02 the country had the biggest debt crisis in history. Banks closed. The economy came to a stop. Factories went out of business. There was hunger and poverty. Protesters set up roadblocks and took food from passing trucks. No one believed in governments, politicians, or their parties. People went onto the streets and banged their saucepans and shouted ‘Que se vayan todos!’ (‘They all must go!’). There were five presidents in only two weeks. From these problems came a lot of popular ideas that included pickets, neighbourhood assemblies and barter systems - exchanging goods rather than using money. Decisions were made by general agreement. Direct democracy grew with the dream that this could really change society. Today, it is clear that some of this dream has been lost. Some groups and some ideas have been taken over by political parties, with some bad results. But there are positive results - what writer and Argentina expert Marina Sitrin calls ‘everyday revolutions’. People are working together with respect, to meet their needs, improve their lives and create some social justice. The strongest have been the workplaces, where the workers take over the business. Today, if a business looks as if it’s going to close, workers don’t lose hope. They take it over and run it for themselves. There are over 200 such workplaces in Argentina today – and the number keeps growing. More than 70 per cent are run with equal pay and no bosses. Economy: GNI per capita $17,250 (UK $37,840). Public debt as % of GDP: 41% (UK 86%, Greece 161%). Member of G20. GDP per sector: agriculture 10.3%; industry 30.6%; services 59%. Exports: Include soy, motor vehicles, beverages, pharmaceuticals, steel, electronics, sunflower oil, fruit and vegetables, cereals, bio-diesel, minerals, fossil fuels. Equality: Income equality GINI index 45.8, 36th in world; Gender equality: 33% of parliamentary seats reserved for women; LGBT: gay marriage; new transgender law. Politics: Head of State Cristina Fernández de Kirchner (Justicialist Party). Re-elected 2011. Mid-term election October 2013. Then, there are the thousands of neighbourhood co-ops – 6,024 new ones created in 2012 alone. If adults have missed education, can’t find work, and find it difficult to buy food or to pay for childcare, they don’t lose hope. They work and learn together in neighbourhood co-ops. With human rights, there has been big progress. Over the past few years, Argentina has moved from having a very bad human rights record to becoming a leader. The mothers, grandmothers and, more recently, children of people who have disappeared, have worked hard and this is putting dictators, torturers and their accomplices in prison. The country also now has the most advanced laws defending the human rights of transgender people. And in 2010 Argentina was one of the first to make gay marriage legal. These are not all simple success stories or simple victories. Some problems still have a long way to go – justice and equality for the country’s indigenous people, for example. And measuring success is difficult and people do not agree on it. Some people complain that the government of Cristina Kirchner brought in militants from the social movements and offered them jobs in ministries and in this way stopped the work of revolutionary organizations. Other people say that the exchange and interaction between progressive movements and the government has brought important changes and some stability. Poverty is a lot less. Healthcare is better. There is now some welfare. Life is much better for most people since the election of the first Kirchner government in 2003. The relationship between the state and the social movements may be difficult and unclear. But the important ideas of independence, equality and workers working together are still alive and growing in Argentina today. And they have a global impact. Marina Sitrin says that Argentina has played a very big role in changing the global conversation between activists on how to bring about change in the best way1. There is information which people do not agree on - Who is right? From Cairo to Athens to Madrid, from Occupy Wall Street to St Paul’s in London, people working together has been the natural way of organizing. The popular meetings that have become a part of survival in Greece and Spain often follow the Argentinean model from ten years ago. And workers in Europe are following the example of worker-run factories. It is too early to say if these European actions will have a lasting effect on their country’s political, social and economic future, as they have in Argentina. Or if the good example of Argentinean popular action will be followed in other places. In the centre of Buenos Aires there is a former children’s home and hospital called El Patronato de la Infancia, in which around 40 families now live. Some of them first occupied the empty building in 1984 and they were still trying to get legal ownership when they were violently evicted in 2003. The building was partly demolished by the conservative city government. In April 2012, the families came back and re-took El Patronato. ‘They’re trying to move us out again, but we have a right to live in the city centre, just like anyone else,’ says Maria Elena Justiniano, one of the original occupiers. Outside, there are police 24 hours a day to stop the families bringing in building materials so that they can make repairs. But the housing co-op is very well organized and they will not give up. This page was last edited on 15 August 2013, at 15:27.